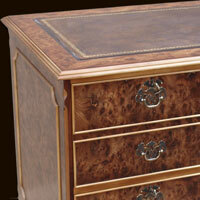 Follow our guide to design your perfect yew, mahogany or oak reproduction Regency pedestal desk. All aspects are covered including computer hardware conversions and appearance choices. 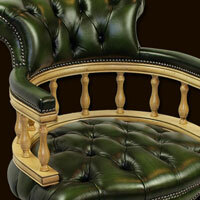 Superb design and attention to detail in conjunction with high class materials and decorative veneers. 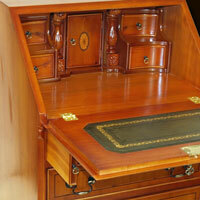 Not only are these items incredible value for money, but they are all kept in stock ready for finishing!! 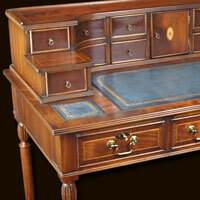 We are pleased to offer this exclusive range of quality reproduction Bureaux. 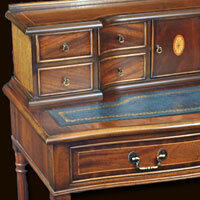 High quality yew and mahogany writing desks with superb attention to detail throughout, at an unusually affordable price! 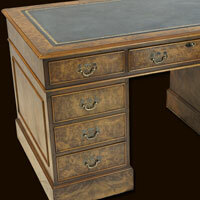 As an alterative to our "design your own desk" we also offer a variety of mahogany and yew reproduction standard desks, computer desks and writing tables. Two, three and four drawer mahogany and yew reproduction Regency filing cabinets, feature inlaid leather tops to match our desk range.